This is the best dessert ever. I’m a journalist in my day job, so trust me. 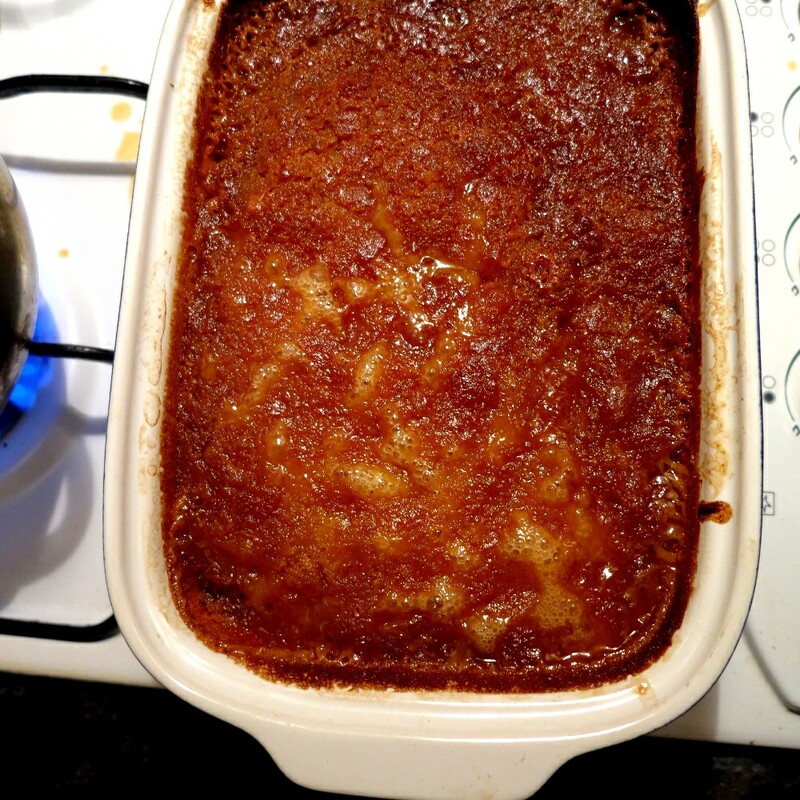 But seriously, I was so amazed at how well this sticky pudding turned out I had to pinch myself between mouthfuls. Best of all I made it myself, quite an achievement for a bloke more used to burning salad and boiling ice cream. I got the recipe from British chef Allegra McCreedy’s wicked little tome Bought, Borrowed & Stolen, which has recipes she’s collected from around the world as well as the stories behind her massive collection of kitchen knives. Be warned though, this pudding is richer than Bill Gates. 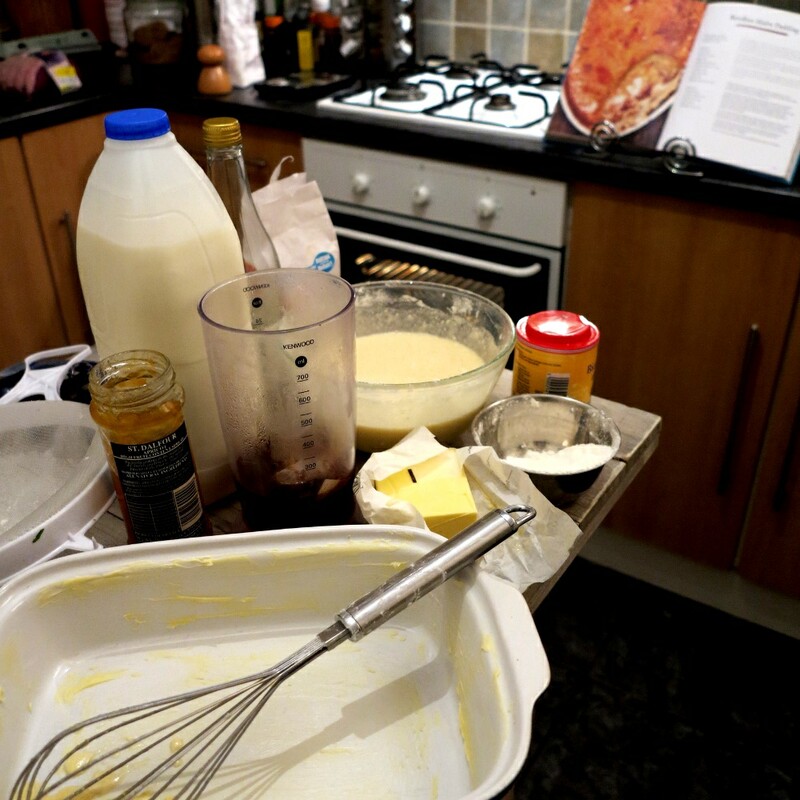 Recipe book open, oven warming, ingredients out – let’s go! 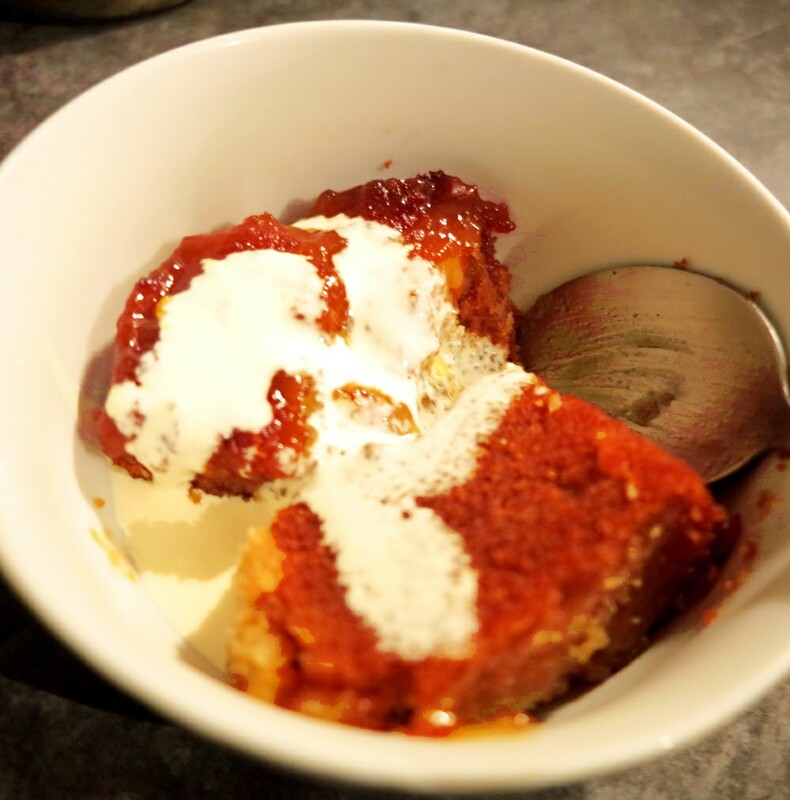 Rooibos Malva Pudding, otherwise known as sticky pudding, comes from the Cape region of South Africa and is dead easy to make. Preheat the oven to 190˚C. Cream 30g of butter with 120g of caster sugar in a bowl, then whisk in two eggs and 2tbs of apricot jam. Dissolve 1tsp of bicarbonate soda in 120ml of milk and keep that at the ready. 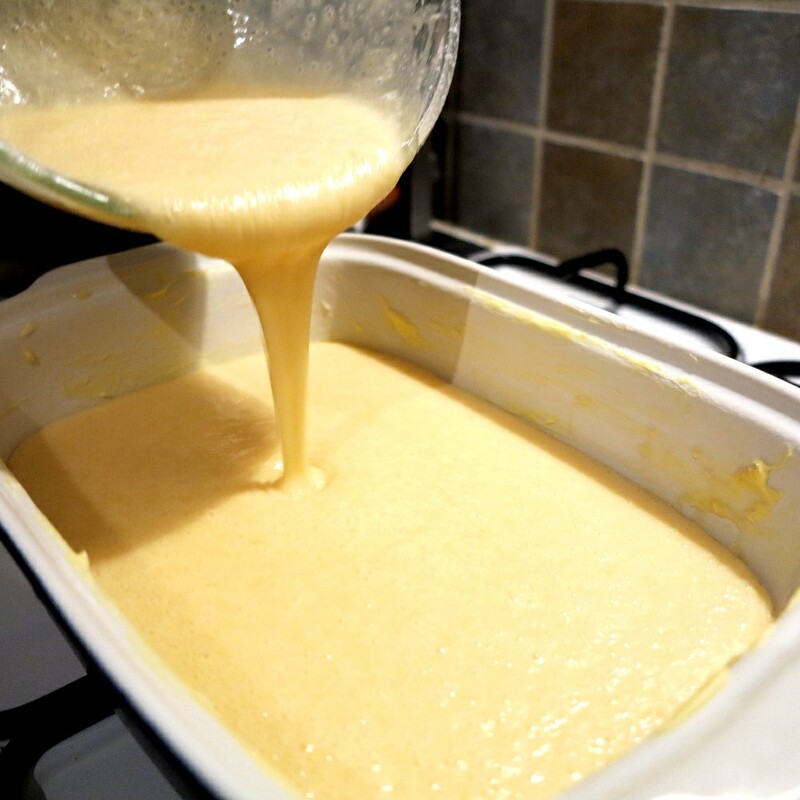 Next, sift 180g of plain flour with a pinch of salt, and mix into the bowl, alternating with the milk until you have a nice gooey texture. Finally, drop in 4tsp of white wine vinegar and wait for the fizzing to die down before pouring the lot into a greased ovenproof dish. Now for the sauce. Grab two bags of rooibos tea (a caffeine free bush tea from South Africa) and infuse them in 140ml of boiling water in a saucepan. When the water is nice and dark fish the bags out, giving them a pinch, and discard. Next, add 140ml of double cream and 60g of caster sugar to the tea, followed by 60g of butter and 2tbs of apricot jam. Bring the lot to the boil then simmer and stir for a couple of minutes. Ladle half the mix over the batter in the ovenproof dish, cover it with foil and whack it in the oven for 30 minutes. When the timer rings take it out, remove the foil and pour the rest of the sauce over the top. Return the pudding uncovered to the oven for 20 minutes so it gets golden and crispy. When it’d done serve up and enjoy with your choice of topping – we went with double cream, and I went for a double helping! Enjoy the sticky pudding! I’d share with you but…! Dave is the co-founder of Double-Barrelled Travel and has been nomadic since May 2013. When he's not busily working on a novel, he can be found exploring a war museum, sailing a yacht (unfortunately not his own), or hiking up a mountain. Sign me up for Double-Barrelled Travel's monthly newsletter! We’re two Australians who took our journalism careers on the road full-time in 2012. We're married but have been saying 'I do' to travel for all of our lives. We live a life full of as little consumerism and as many experiences as possible. We hope our blog is useful, giving you tips on kick starting your life journey to a full-time working nomad. If that's not for you, we hope you still find inspiration in our wanderings. We’re Dave and Carmen – husband and wife, journalists and writers, travellers and companions. We have been nomadic since mid-2013, with a hiatus to have our daughter, and are making a living through our copywriting business Red Platypus as we travel the world. If you want to become nomadic and fund your travels by working for yourself, we hope we can provide some advice and inspiration to help you make it happen. © 2018 Double Barrelled Travel. All Rights Reserved.